Not to worry, though; the Drug Enforcement Administration is on the case. Not only are they protecting us from ourselves, they’re also looking out for our furry friends. In a hearing before the Utah state legislature, DEA Special Agent Matt Fairbanks posited that legalizing the herb there could have a powerful effect on the state’s ecosystems. One of those effects: stoner rabbits. In fairness, Fairbanks was testifying about the damage that unregulated outdoor cannabis cultivation might wreak on Utah’s environment. However, that’s not very funny so let’s concentrate on the rabbits. Fairbanks served on the DEA’s Cannabis Eradication Team. This $180 million program employs 120 agencies to demolish marijuana grow sites nationwide. In 2014, the program eradicated 4.3 million marijuana plants, just shy of the 4.4 million that were eliminated the year before. Even by Miley Cyrus standards, that’s a lot of weed. And by anyone’s standards—except the federal government’s—$180 million is a lot of money. What else could you buy for that kind of change? Well, the US Department of Energy recently announced that it will spend $180 million on six new projects that focus on developing more energy storage solutions for solar power and making our power grid more resilient. Think solar’s just for hippies? Then you spend your $180 million on a Picasso that looks like he was stoned when he painted it. Or you could give it to the DEA so they can continue the fight against people who smoke flowers. But back to the cottonmouth … I mean cottontails. 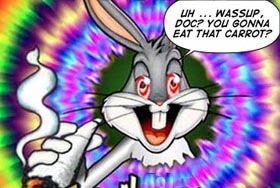 While in the field eradicating ganja plants, Fairbanks noticed that rabbits had apparently “cultivated a taste for marijuana.” When I first read this I thought he had misinterpreted the rabbits’ naturally red eyes. But that’s not what tipped him off; what led to his specious conclusion was the lupines’ mad chill. Fairbanks never claimed to witness rabbits eating—or smoking—any weed. And he didn’t mention any other evidence of the bunnies being baked, like empty bags of Crazy Carrot Doritos. It’s also not clear that their failure to run away means they were high. Rabbits in the wild will often freeze when scared. But it definitely sounds to me like the bunnies were having a textbook, “Whoa, did that really just happen?” moment. But after yukking it up over that image, I feel like going full Tea Party on these DEA schmucks. Not even the most chronically baked pothead could come up with more nonsensical arguments for spending $180 million to eliminate hemp plants. I’d love to read more about their supposed ecological ruin theory. And at any rate, how would that be the Drug Enforcement Agency’s call to make? Of course they didn’t run away. Too much effort required.